Hi there everyone!!! Pahlish has some gorgeous shades that released today on preorder! This is an 8 piece limited edition collection and it won’t be available again after 11/1. All of the shades are $11 a piece or buy the set for $80. Also, if you buy the full set, you get a surprise Trick or Treat bespoke batch exclusive to this event! Preorders will begin shipping on 10/18. Let’s jump on into the swatches! First up we have Deadly Nightshade- a royal purple linear holographic with multichrome blue to pink shimmer. This gorgeous polish was opaque in two coats. There are gorgeous blue shimmers if you look closely at my picture. 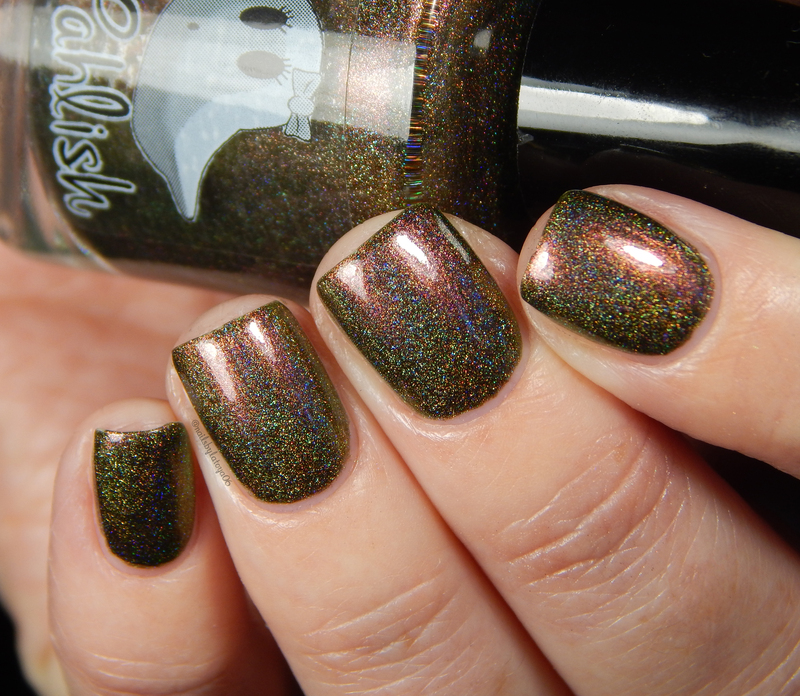 Next up we have Frog’s Breath- a bright olive linear holographic with multichrome red to green shimmer. This is one of my favorites from the collection. It was opaque in 2 coats. Next up we have Pumpkin King- a warm rust linear holographic with multichrome purple to gold shimmer. Such a beautiful shade! This was opaque in 2 coats. Next is Ride With The Moon- a pale blue scattered holographic with pink and orange chameleon flakes and shimmer. This shade is just everything!!! Ugh! I love it soo much. It was opaque in two easy coats. Next is What’s This? !- a soft orchid pink scattered holographic with muticolored chameleon flakes and shimmer. I used two easy coats. All of the formulas to these holos are amazing! Oogie Boogie is Next and it’s described as a soft grey scattered holographic with green/teal chameleon flakes and shimmer. I used two coats for the photo! Next up is Lock, Shock, and Barrel- a sheer grey scattered holographic with red and purple multichrome shimmers. This gorgeous shade was opaque in two beautiful coats. And last but not least we have Sandy Claws, another one of my favorites. This shade is described as an oxblood scattered holographic with blue to pink multichrome shimmer. I used two coats! Make sure you top coat this one, it dries down a bit matte/dull. There you have it! All of the shades are super duper gorgeous and sparkly! These are available right now for preorder in Pahlish’s shop until 10/21 midnight central time. Be sure to check out Pahlish’s IG and Facebook! If my pictures weren’t enough to get you to order some, check out my swatch video of them down below!!! Thanks for reading today and I’ll talk to you all soon!